About 8.5 percent of China's total population is scientifically literate in 2018, a 2.3 percentage point increase compared to 2015, officials said on Thursday. This means more Chinese can now understand and appreciate science and apply it to solve issues in life and at work, they added. The figure is from the 10th national survey on scientific literacy, which concluded in 2018, said Bai Xi, director-general of the Department of Science Popularization at the Chinese Association of Science and Technology. The complete results of the latest survey have not been published. The association has been conducting these surveys since 1992, and they typically have more than 50,000 respondents, said Xu Yanhao, vice-president of the science association. The survey tests respondents' basic science knowledge, opinions on key scientific issues and their ability to use science to make decisions and solve problems. In 2005, about 1.6 percent of China's population was scientifically literate, according to the science association. In 2007, the proportion rose to 2.3 percent, and it reached 6.2 percent in 2015, during the ninth survey. "The Chinese people in general are becoming more scientifically literate since the reform and opening-up," Bai said. However, China still has a substantial gap compared with other advanced countries, he added. In 2010, about 3.3 percent of China's population was scientifically literate, which was on par with percentages for developed countries－such as Japan, Canada, and European countries－in the late 1980s, according to the eighth national survey. In 2005, the State Council issued the world's first government document on systemically improving scientific literacy during the next 15 years, Xu said. By 2020, China aims to have 10 percent of its population become scientifically literate. "The 10 percent is a threshold," said Xu. "The history of more than 30 technologically advanced countries shows that they generally become innovation powerhouses when at least 10 percent of their population is scientifically literate, he said. "Ten percent of China's population translates to more than 130 million people," Xu said. "Imagine having this many people who are literate in science. Our nation's innovation capacity and scientific development will surely soar in the future." 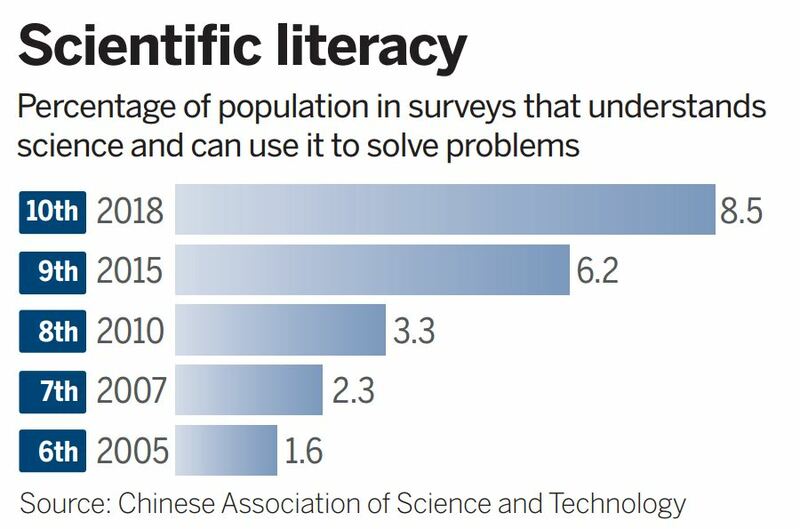 Huai Jinpeng, executive vice-president of the science association, said China still has a huge disparity in scientific literacy between urban and rural populations. In 2015, Shanghai, Beijing, and Tianjin were ranked as the top three areas in the proportion of residents who are scientifically literate, scoring 18.7, 17.6 and 12 percent, respectively, the ninth national survey said. However, the survey also found more than 20 provinces were below the national average in scientific literacy. About 9 percent of China's male population was scientifically literate in 2015, significantly higher than the 3.4 percent of China's female population. "China still has a large group of poor people who need science to improve their lives," Huai said, adding the science association has been helping poor farmers reap the benefits of science, such as in planting new crops or using new irrigation methods, for around three decades. "Improving scientific literacy, upholding the scientific spirit, and spreading the use of scientific methods are crucial in eliminating superstitions and false rumors," he said. "This will be a long and challenging process, but we are confident in overcoming the issues."